Tringkap is one of the many towns located around Cameron Highlands. 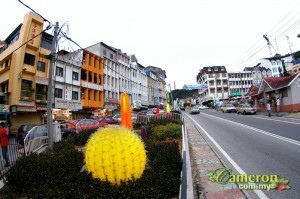 It is located towards the northern region of Cameron Highlands which is closer to the northern gateway of Kampung Raja. Tringkap has a thriving local community as it is known to be one of the busiest towns around Cameron Highlands. The town of Tringkap is located about 5 minutes away from Kampung Raja and can be reached via Brinchang town. As such, it would be most ideal to come to Tringkap through the northern route coming in from Simpang Pulai or Gua Musang. Here in Tringkap are many interesting tourist attractions which are still unperturbed by the rapid development of other towns like Tanah Rata and Brinchang. As such, you will find that Tringkap maintains a lot of its nature and traditional elements. Tringkap has actually been quite successful in retaining its rural characteristics over the years. In Tringkap, visitors appreciate the quitter and more peaceful environment in which they can visit many different tourist attractions like the Rose Valley and the Cameron Trinkap Bee Farm, one of the most popular bee farms around. Tringkap was formerly referred to as the ‘Dai Kong See’ among the local people of Cameron Highland.s this is because Tringkap was where the Boh Tea Plantation was once located. The Sungai Palas Boh Plantation operates not far from here today. Visitors to Trinkap will enjoy visiting the farms as well as shopping for local produce like fresh vegetables, strawberry and honey products and many more. Among the other attractions here in Tringkap is the Guan Dai Miu or Guan Dai Temple which has a beautifully designed and landscape surroundings. There is a Water Well within the temple and various other sculpture and statues that pay homage to the Lord Guan Dai deity. The Rose Valley in Tringkap is another popular hotpsot. Here, there are more than 450 types of roses for those who love this type of flower. Apart from that, the Rose Valley houses other species like Lilies, Gerbera, Lady Show and Carmellia and has one of the largest flower vase in Malaysia. The Cameron Lavender Garden is one of the most recent additions to Cameron Highlands. There are many types of flowers grown here among its beautiful landscape and scenery. Meanwhile, the Cameron Tringkap Bee Farm is the perfect place for anyone who wants to know how honey is produced from wild bees and buy some honey produce to take home.